How long have you not written with a pen? With the popularity of smartphones, computers, and tablets, there are fewer and fewer people writing with fountain pens. It seems to be a symbol of nostalgia. How long have you not written your mood and your missing to those who deserve to be cherished? --Perfect gift for birthday, house warming, Christmas, thanksgiving, valentine's day, wedding anniversary, holiday, graduation. --Now, just shop with confidence! APPEALING AND EYE CATCHING DESIGN--- With classical artistic temperament, but without losing the sense of fashion and eye-catching, this pen is rich in streamlines. The environmentally friendly acrylic of material, matches with metal ring on pen barrel and golden pen clip, fully reflects the quality of Seiko. fashion fountain pen. It has a very artistic collection value. How wonderful such an unique design it is! THE DETAILS REFLECTS THE QUALITY--- Iridium medium nib will deliver you a fluent writing experience without scraping paper. Rotating cap, which makes a good protection for the pen tip. Crystal transparent resin of the pen top, golden kangaroo pattern and golden logo around, highlighting the power of the brand ''Kaigelu''. ONLY GIVES YOU THE MOST SURPRISED CREATION--- Irregular patterns bring about each pen amazing. Made of celluloid resin, they are cut and then polished with brightness. This fountain pen looks peaceful indoors, but why not show it in the sun? It will surprise you! Just have a try! Turn the pen slowly and you will find it marvelous. So crystal clear and beautiful of pattern on pen, like the powder is shining in the sun! 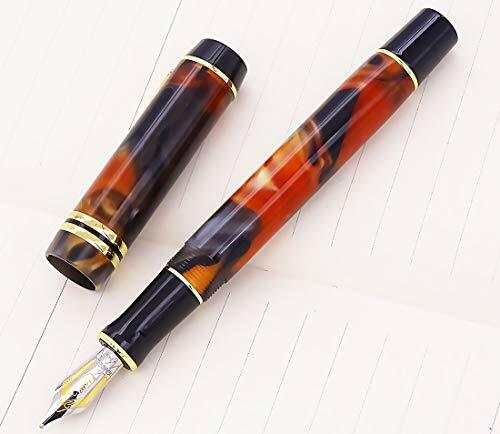 A PRECIOUS GIFT---A good pen, like a good friend, will take you to enjoy the beautiful scenery, achieve the glory of the career, and create a beautiful life. Along the way, thank you for your accompany, my friends, my family, my lover. Deductive belongs to your Kaigelu. After all, you will be obsessed with this pen, just like us. View More In Education & Crafts. If you have any questions about this product by erofa, contact us by completing and submitting the form below. If you are looking for a specif part number, please include it with your message. Gray Felt Letter Board 10x3.5 inches. Changeable Letter Boards Include 150 3/4" White Plastic Letters & Oak Frame.